In June we discussed French rugs; today we will look at a Frenchman who revolutionized the weaving of patterned textiles. What does Jacquard have in common with sabotage and computer programming? Read on and find out. 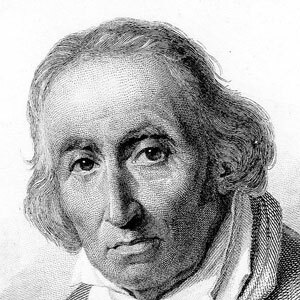 Lyon had been the silk-weaving center of France for 200 years when Joseph Marie Jacquard was born in 1752. He was the son of a silk weaver and entered the profession himself. However, Jacquard was a poor businessman and his weaving company failed, partly because he spent much of his time trying to improve the process of weaving. After the French Revolution, Jacquard returned to Lyon and, while working in a factory, constructed an improved loom for silk fabric weaving, based on the prototype loom invented by Jacques de Vaucanson. 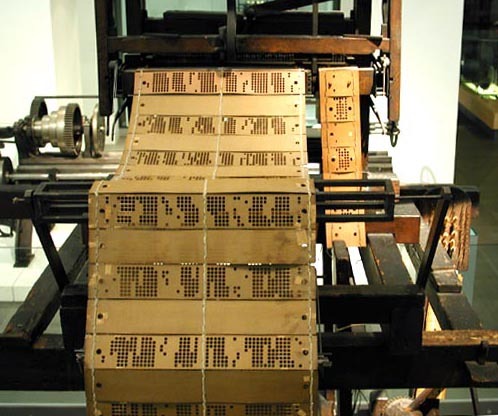 Unveiled in 1745, Vaucanson’s loom – the first completely automated loom the world had ever seen – used repetitive movements guided by holes punched in heavy cards, which gave precise automation to the weaving process. However, the loom was not adopted by the industry and was placed in a museum. News of Jacquard’s work reached Napoleon himself, who provided the funding for completion of the loom. Finished in 1801, Jacquard’s first loom was nothing less than revolutionary. It enabled individual threads in a pattern to be lifted one at a time and in the proper sequence to create the desired pattern in the woven silk. Jacquard’s innovation attached each thread to a wire that was itself connected to a needle, which made it possible to raise each warp thread independently of the others. Above this linkage rested a bar capable of lifting the wires and their individual threads. What set his invention apart from the work of Vaucanson was the use of needles. Driven forward by the action of the loom, the appropriate needles would enter holes punched in heavy card stock, triggering the lifting bar which would in turn raise the proper wire and its thread. Needles that did not touch a punched hole would be forced backward, detaching that wire from the lifting bar. Only the threads specific to a particular portion of the pattern would be woven. Cards are perforated according to pattern. The preparation of these perforated cards was the really slow and difficult part of the weaving process. A new set had to be prepared for each new pattern. The Jacquard attachment could be applied to almost any loom. It is regarded as the most important apparatus ever adapted to weaving, since it made possible the automatic production of all varieties of pattern weaving. Upon seeing his loom in operation, the weavers of Lyon were up in arms. Fiercely protective of the skills they had mastered and on which their livelihood depended, these hand-loom operators attacked Jacquard and his mechanical invention. Jacquard survived the assault, but his machine was destroyed. Yet Jacquard would not be deterred – he continued to improve his loom, increasing the efficiency at which it operated. His punch-card guidance system was constructed as to be attachable to existing looms, which reduced its cost and further enhanced its practicality. Sales began to take off. However, employed weavers discovered that the loom’s guiding machinery could easily be rendered useless by dropping a wooden shoe, known as a sabot, into the works. Six years after Jacquard’s death in 1834, the French government honored the inventor with a statue erected on the site in Lyon where his first loom had been destroyed. The acts of destruction aimed at his machine are among the first widespread examples of industrial sabotage; the workers’ shoes and their targets having given a word to the language. Jacquard’s standardization of the punch-card system for guiding mechanical operation would come to be seen as perhaps the earliest precursor of computer programming. Punch cards remained prevalent in the computer industry well into the digital electronics revolution. The technology of the Jacquard loom has been applied to weaving Wilton and Axminster carpet, which we still see today fabricated into area rugs. Modern Jacquard loom attachments, however, are computer controlled, with the punch cards having gone the way of…well, punch cards.